White water in the Ottawa Valley | Turning my world upside down! Russ from our CLEE group organized a great weekend up in the Ottawa Valley. We arrived on Friday evening in anticipation of an early start on the Ottawa river for our white water rafting adventure. 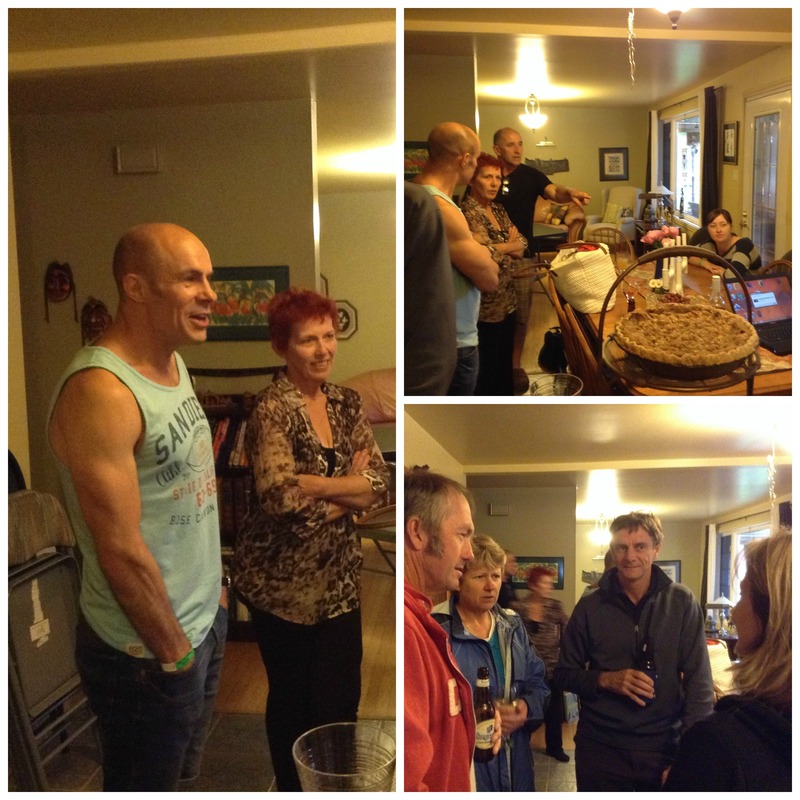 The evening was warm and the conversation flowed as it always does with former exchange teachers. We arrived and changed into our bathing suits once our all important release forms were signed and initialed 3 times. Down to the wetsuit rental area after paying $20/person for the rental. Luckily I had by water shoes, so I didn’t worry about losing or ruining my runners during the day. By then, some of the other teachers had joined us and we waited, all dressed in our wetsuits, until it was time to board the bus, almost 2 hours later. Leon was trying the adventure tour, so his bus left about 45 minutes after mine. At this point, the worse part was keeping the blackflies and mosquitoes from chomping on my face, the only part of me that wasn’t covered. I put on the sunscreen, hoping for a bit of sun at the end of this rainy week, but I never thought to put some insect repellent on. We met our tour guides and were told that the river might take our rings, shoes and glasses. Leon went back to the camper and placed all our valuables (rings and all) in a safe place, far from the nasty, greedy river. I boarded my yellow school bus with 6 others who would be joining my group, along with several other more adventurous rafters, including a large group of young men who felt they were above wearing wet suits. Their only protection from the cold water, the insects and rock scrapes was green war paint. Ok, whatever floats your boat, right? At this point we were told the raft trip would last about 5 hours. Wow!! I didn’t expect that. I would be insect bait for a whole day. Yikes!! We arrived at our departure point and met our own guide, Quiney, a nice young man with a lovely, friendly disposition. He gave us some serious instructions about how to act during the various passages over the rapids, like the position called “hope and float”, made sure we had our helmets, paddles and lifejackets and spurred us on to our 6 man raft. Wait a minute – I had a paddle and was expected to use it? This was not going to be a gentle ride down the river. 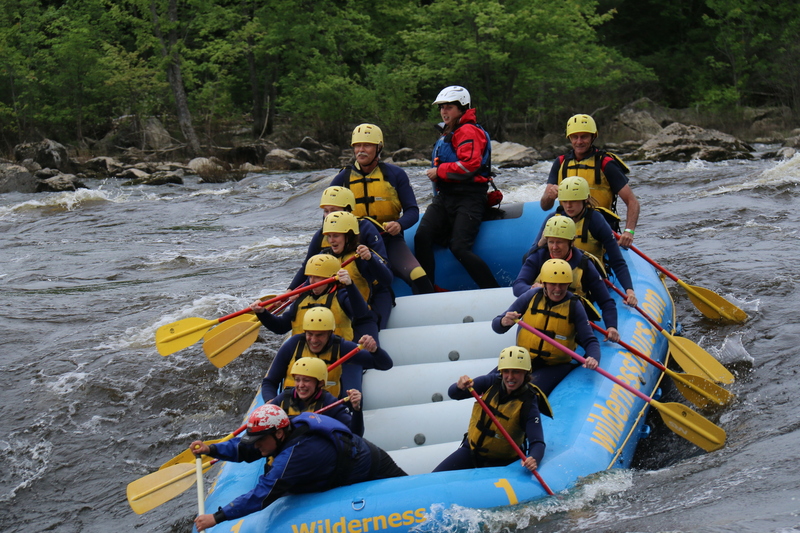 Over the day, we approached each set of rapids with detailed explanations and instructions. We actually walked around (portaged) 2 of the rapids as they were considered too difficult (read dangerous) for our group. Once in a while, we would meet up with the other small raft and listen to stories about the local folklore and some of the accidents that have happened on the river. We were followed by a group of small sport kayaks most of the day and got to watch them tangle with the rapids while we listened to instructions. We were also allowed to try body surfing down one small rapid. I tried it with some trepidation, but found I couldn’t even stand on the slippery rock bottom because of the strong current. Oh forget it! Lunch was at a small landing and consisted of hot potato soup and grilled sausages and/or chicken breast. I can’t remember eating a more delicious meal, I must have been very hungry. The kayakers joined us for the meal and we even got to see a large turtle – about 20 lbs. Sustained with this hot soup and grilled meat, I was suddenly full of energy and courage. 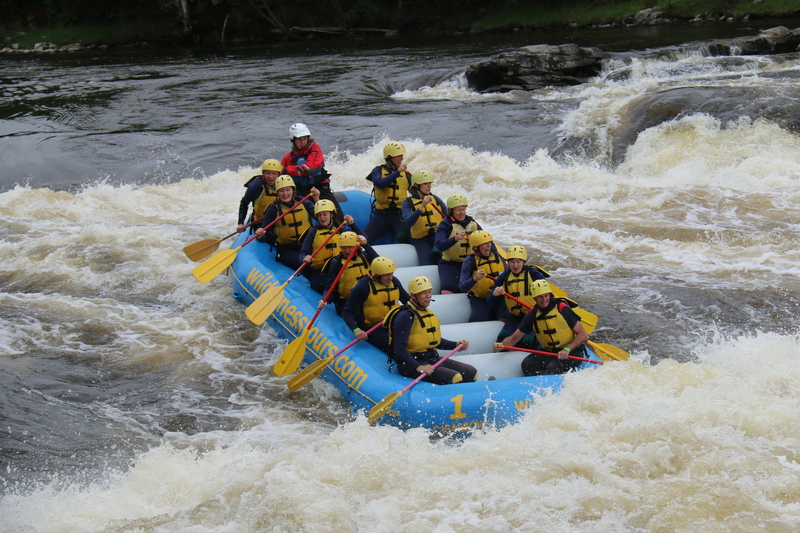 We went down a couple of other rapids and I got good and wet but we never fell out or anything. Back at the base camp, we enjoyed a hot shower, a glass of wine and waited for the other group to return as we watched the video of our day. Leon’s group returned while we were in the amphitheatre enjoying the movie. He was full of bruises and some serious scrapes which he acquired during a major spill on his “not so easy” rafting trip. His raft was much larger, holding about a dozen people and 2 tour guides. When they reached a most challenging rapid, the Colosseum, the whole thing went over sideways, dumping them in rapid water, over unseen rocks. Leon was under for what seemed like a long time and got scraped by the rocks as the water kept pushing him under. He reported the day was not as active as mine, with them waiting for the other rafts to go over rapids at each stop. So all in all, I don’t think he enjoyed his day as much as I did, but he sure has one heck of a story to tell. One of his guides, a young woman who has just recovered from some serious facial surgery was injured by the rocks herself, sustained a cut deep enough to require stitches. Don’t you just love their quiet Saturday adventures? As for the other exchange teachers, they got the chance to see our very green, very wet country at its finest, something they imagine and hope to find when they travel here. Their biggest surprise so far has been how quickly we went from winter to summer since they arrived in late January. Yup, that was our spring, somewhere in there. We ended the evening back at Russ’ where his lovely wife Nancy had been cooking and baking up a storm. Nancy doesn’t like water and opted not to join us for the day. Smart girl that Nancy!! We had a great bbq and shared our stories about the day’s adventures with Leon playing the video of their capsize in stop-motion so they could analyse what happened. Unfortunately, the filming only showed the actual upset and not the recovery of their good ship. We figure the tour company doesn’t want to scare people off. Have a look at the promotional video if you get a chance.